Another story from the casebook of a private detective operating in the North of England during the Victorian era. It was a cold and windy Monday morning early in February. Not for the first time, Rupert Swann had been obliged to change his plan for spending a day. With no case on hand, he had intended to have a leisurely time, featuring some piano practice, a walk around the Leeds city centre, a late lunch, a session studying mathematics, an evening meal at his favourite restaurant and an hour or two at his club. He was occupied with the first of these pastimes, wrestling with a Chopin polonaise, when he was interrupted by the housekeeper, who brought an unexpected visitor to his rooms. The caller was a tall, gaunt woman, very well dressed and with an erect, stately carriage. Swann guessed that she was probably in her middle forties. In a cultured voice, she apologised profusely for not having made an appointment, but said that circumstances had not permitted her do so. 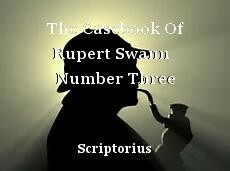 Swann was gallant in his dealings with women and he put her at ease by assuring her that he understood. He asked her to remove her topcoat and gloves, join him by the fire and explain what had brought her to him. I guess you thought you’d seen and heard the last of me. Well, you haven’t. It took a while for me to trace you, but I did it. Now it’s time to settle accounts. You should know that nobody crosses me and gets away with it. You owe me and the rest of us the $32,000 you stole, and I’m charging you another $5,000 as interest and $3,000 for my expenses in finding you. That comes to $40,000. Don’t try to run. I sent two of the boys over and they’re watching you day and night, but you won’t spot them. And you can’t go to the police, can you? I mean, if you do, you’ll have to tell them what you did and I guess you’re not going to confess to that. I’ll be along soon and will let you know when I aim to call on you. Just make sure you have all the money and maybe you’ll get out of this with a whole skin, although I’m not making any promises about that. Be seeing you. J.A. “Thank you. Simply talking with you has given me some relief.” With that, the lady stood, put on her coat and gloves and left. Shortly after Mrs Carrington’s departure, Swann was struck by a thought that caused him to go to the telegraph office and send a cablegram. He then put the problem to the back of his mind. It did not remain there for long. The morning following their conversation, he had just finished breakfast when he received a telegram. Opening it, he read: Urgent I see you again at once. Will call noon. Please see me. Carrington. Well, I’m in England now and I’ll be on my way to your place pretty soon. The boys are still watching you, so don’t try any tricks. It’s Sunday now and you’d better have that money ready by seven-thirty Thursday evening. That’s when we’ll be calling on you. Like I said before, if you play this right, I might just let you off the hook. J.A. Mrs Carrington confirmed that she intended to go back to her home, so Swann escorted her across the road to the cab rank, from where the pair took a Hansom for the four-mile journey to the suburb of Seacroft. When they arrived, Swann asked the driver to wait, then he accompanied the lady to her front door, took his leave of her and spent a few minutes walking around the neighbourhood. The Carrington residence was a detached one, built of red brick in the Georgian style and much like the two flanking it. The garden was bordered front, left and right by a dense privet hedge, four feet high, broken only by an iron gate which opened to a path that led to the door then divided to run completely around the house. The property directly opposite the Carrington one was almost a replica of it in structure and garden layout. Having seen enough, Swann boarded the Hansom and returned to his rooms. Shortly after reaching them, he received a reply to the cablegram he had sent after Mrs Carrington had left him at the end of her first visit. The message caused his eyebrows to rise and impelled him to send another cable, this time to a different destination. That done, he occupied himself with the piano practice and mathematical studies he had interrupted the previous day. Just as he was finishing breakfast on the Wednesday, Swann received a reply to his second wire. What it contained prompted him to walk to the telegraph office and send a message to Mrs Carrington, informing her that he intended to call on her at three that afternoon unless she responded that she would not be available. He then took his usual daily walk, consumed a pint of beer and a meat pie at Whitelock’s, the oldest public house in the city and his usual lunchtime haunt He arrived back at his lodgings shortly before two o’clock, smoked a pipe for a few minutes then, as there was no answer from Mrs Carrington, he crossed the road to the cab rank and took a Hansom to her home. The lady was controlling herself with great difficulty, the edge to her voice even more pronounced than when she had visited Swann earlier. She led the way to the sitting room and motioned him to take one of the two chairs by the hearth, occupying the other herself. With no time to waste, Swann asked whether she had taxed her husband about the two letters. After leaving the Carrington house, Swann spent two hours making the arrangements he felt necessary. He then returned to his piano practice, followed by an evening meal at Powolny’s restaurant and two hours at his club, where he played a long game of billiards, losing to a wily old fellow he had never managed to beat. Back in his rooms, he smoked his last pipe of the day and went to bed at midnight. Other than the Carrington case, no professional matter had arisen during the week, so Swann spent much of Thursday studying calculus. At five in the evening, he emerged from his lodgings, checked that the plans he had laid were ready for execution, then took a cab to the Carrington residence. He arrived there at six-fifteen and was admitted by the lady, who ushered him into the sitting room and introduced him to her husband. Carrington was a tall man of medium build, with a full head of hair, black apart from traces of grey at the temples. He confirmed immediately that his wife had been right in thinking that he had concealed the two threatening letters from her, adding sheepishly that he should have known better but had thought and hoped that the whole episode was a prank. Mrs Carrington produced tea and biscuits and Swann, refusing to be drawn with regard to his intentions, would talk only about mundane matters until seven-fifteen. The sitting room lamp had already been lit and Swann asked Carrington to light those in the hall and the dining room, so that there would be illumination behind the door and at both sides of it. He then excused himself from the lady and trotted upstairs and peered out at the street from the still-dark landing. The Carringtons complied. About a minute later, there was a loud rap at the door. Swann opened it to see the man who had knocked taking three or four steps backwards to a position between his two companions. The man, middling in height and build, with a dark complexion and craggy face scowled. “Who the hell are you?” he barked. A police wagon drawn by two horses came out of a side street where it had been waiting and stopped at the Carrington house. As the prisoners were bundled into the carriage, the inspector joined Swann. “I think we could call that workmanlike job all round,” he said. The Carringtons, Swann, the inspector and Arvin gathered in the sitting room. Constables Bradley and Shaw stood guard outside the closed door. Mark Carrington looked like a man in a trance. His wife asked Swann to clarify everything. Taking two papers from a pocket, Swann smiled at her. “You put me on the right track during our first talk,” he said. “You remarked that your husband had a younger brother who was similar to him in appearance but different in character. You then remarked that the brother had emigrated to Australia, specifically Melbourne, and you also told me his name, Michael. You later said that your husband’s name is Mark. When I saw the letter addressed to M. Carrington, I began to wonder whether we might be dealing with a case of mistaken identity. I put this information together with your description of your husband and yourself as largely stay-at-home types and the fact that Michael was clearly more adventurous. “After cogitating briefly, I sent a cable to the chief of police in Melbourne, asking whether he could tell me anything about Michael Carrington. I have here his reply. It reads: Rogue. Left for USA 1894. Good riddance. Swann put that message aside, opened the other paper and went on: “I have an acquaintance in the New York Police Department, so I sent him a cable asking whether he could give me any information about Michael Carrington. This is his answer: Armed. Dangerous. At large. Member Arvin robbery gang. Seen Baltimore late December. Returning both papers to his pocket, Swann continued: “I had heard of Joe Arvin’s band and I had no doubt that I had been right in thinking that they were pursuing the wrong man. I understood from your wife that you are a creature of habit and that you always leave here and return at the same times and in the same way. It did not take much imagination to grasp that the gang leader’s two accomplices must have watched you come and go and that they had to do so from a distance. They would have seen you only emerging from the house to board your cab, returning and alighting from the vehicle and – though I felt this unlikely – following you to your place of business. There they would have seen you only entering or leaving, very briefly at that and in poor light. “When I noted that the second letter addressed to you had been posted in Southampton only a short time before the threatened visit to you, I saw that the matter was very serious. I explained the position to Inspector Nicholson. We carried out a reconnaissance of the area and devised a plan. As we were taking tea and biscuits, six of Inspector Nicholson’s men secreted themselves in the back garden here and two others behind the privets of the house facing yours. I kept Mr Arvin talking to allow the inspector and his officers to encircle the three men. As I mentioned earlier, the darkness and wind noise helped us but we could have used another version of our scheme which would have worked had the conditions been less favourable. The desperado gave a rueful smile. “Well, I guess I’m bound for the calaboose anyway, so it won’t do any harm to give you the details. We did a big railroad job last year and got away with the thirty-two thousand dollars I mentioned in my first letter to Carrington. He was holding the money when we split up, which was how we’d arranged things. The idea was for us to gather at a hideout the following day. Carrington never turned up. We soon found out from newspaper reports that he’d got away all right and been spotted in one or two places but hadn’t been caught. I’d no doubt that he’d swindled us, so I set about tracking him. The inspector grinned. “Oh, there will be list of them. Threatening conduct and carrying arms with intent to inflict violence will do for the moment.” He called in his two constables, instructed them to take charge of Arvin and said he would join them outside in a few minutes. They handcuffed the prisoner and walked out. Nicholson congratulated Swann on his part in the proceedings, told him and the Carringtons that he would need statements from all of them, then he left. Mark Carrington was effusive in his thanks to Swann. He was clearly embarrassed by his failure to take his wife into his confidence. Swann did not wish to play any part in the familial scene. He left the house, walked to the main road, found a cab, returned to the city centre and enjoyed an evening meal, once again at his favourite restaurant, Powolny’s, after which he spent two hours at his club in Cookridge Street, satisfied that he had done a good job, albeit with a somewhat theatrical touch.